Tomorrow it starts. 15 Sept 2018. Although a bit too warm, I will climb my backyard tree. The crossbow hits just fine. but being 90 feet from my garage will cut down on travel time. Good luck to anyone else heading out. Why don't you just sit on your porch? I got a crossbow for Christmas and haven't even gotten to shoot it yet. I guess I know what I need to do this weekend. Your backyard, that's awesome. My municipality doesn't allow any hunting. Shot about 30 arrows today. Well, one arrow that I cut and glued the insert in to see how it shot. Pretty well once I adjusted my sights. I need to do the remainder and put some broadheads on. I am not going out tomorrow, but will be out during the season at some point. Of course, I said I was going dove hunting too and haven't done that yet either. Good luck to everyone going. Doesn't the PGC have a preemption sorta thing going on when it comes to game laws? Thought I read somewhere that municipalities couldn't put any further restrictions on hunting. I'm still trying to get my first deer. 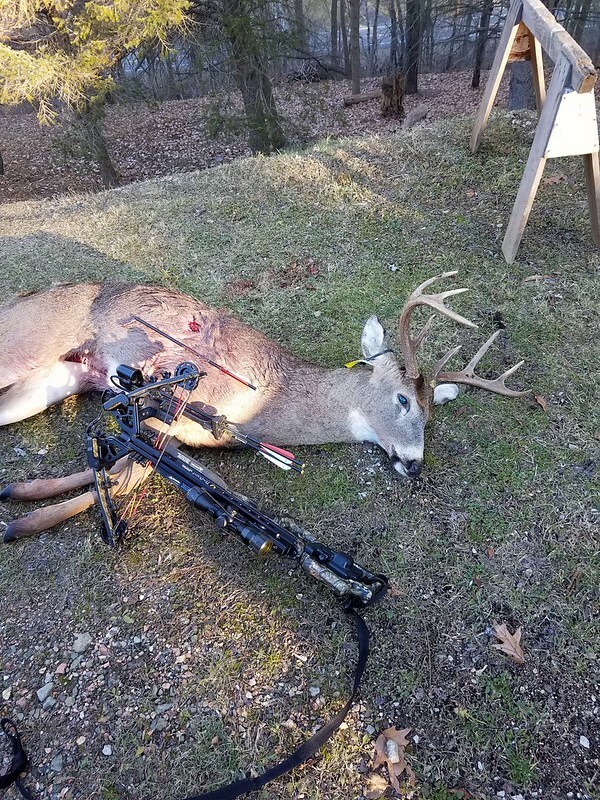 I told myself that I'd walk before I'd run, that I'd wait until I got a deer with a firearm before a bow. But after my "close but no cigar" experience with a buck last season, it's on. Got myself a bow and have been messing around with it for several months. Won't be out tomorrow though. Wind forecast isn't so favorable for my spot. I think you're right. I found an article from 2013 about it. Interesting. I live on a 1/2 acre. It seems I am allowed to override my 50 yard (archery) safety zone, but I have to abide by all of the neighbors. I probably have a very small shot corridor, but that would be cool. Now, on another note, a neighbor recently saw 6 coyotes cross the road two doors down. We haven't seen rabbits or deer around here in almost 2 months and we are usually over run. I'd shoot a coyote with my bow no problem, and I doubt I'd get complaints. The game commission said I could hunt off my deck. Projectile path is an issue. A road runs at the bottom of my hill so shooting from the tree instead of my deck is a good down angle following the 4th safety rule. I live at the end of a suburban housing plan with woods behind me. Under my tree is a natural funnel with a trail on the high and low sides. These are last weeks game pics. And this very young guy I won't shoot. It doesn't take long to dial in. I shot mine at 20 through 50. Leaves at this point limit my range to about 30 yards although it's as far as I would ever chance a shot. Last thing I want is to have a bad hit and have the deer run to the school bus stop. My concern would be the deer running off of my property. Thanks. Retrieving an animal should not usually be an issue. I think the game commission states that you should make every effort to do so. A local LEO manages some property that abuts mine. He will not give me permission to hunt but understands that I'll go into his land to retrieve. He is ok with that. Why does archery season stop again?